This election cycle is pushing many of us to drown our sorrows in food and booze. But thanks to a new beer-and-ice-cream mashup, doing your civic duty never tasted so good! Hillary or Trump? Trump or Hillary? You can leave the Big Decision to the pundits and focus your attention on the real choice: A pint of ice cream or a pint of beer? 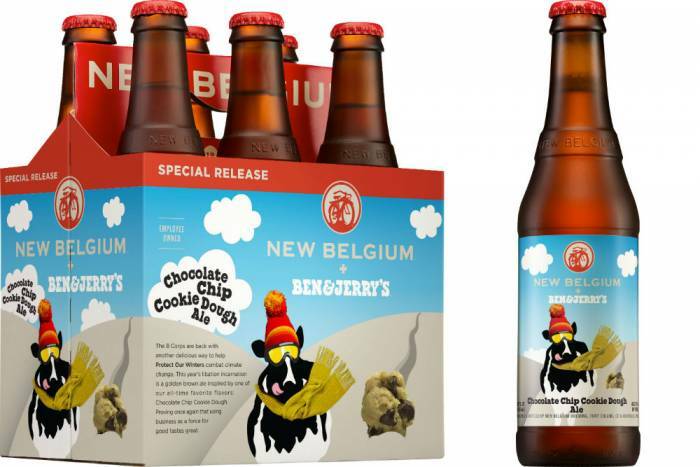 Ben and Jerry’s and New Belgium are teaming up for the second-straight year to make that choice a little easier with the new flavor Chocolate Chip Cookie Dough… Ale. Best of all, proceeds of the sweet suds go toward the “100 Days To Change” initiative, a multi-city campaign of events to push climate change to the forefront of the incoming administration. First things first: the beer. The indulgent brew is a blonde ale with “hefty doses of chocolate, brown sugar, and vanilla” that tips out at 6 percent ABV. According to New Belgium’s tasting notes, the limited-release ale is plenty sweet and has a medium-light but creamy body “with some small particulate.” Just like mom used to make! Chocolate Chip Cookie Dough Ale hits shelves at the end of October in “Folly” variety packs, with straight six packs to follow. As a bonus, drinking this beer can actually help make a difference in the fight against climate change. A portion of all sales from this beer will be donated to Protect Our Winters (POW), a non-profit organization comprised of winter sports athletes, businesses, and brands. Since 2007, POW has been uniting big names in winter sports to raise awareness of climate change and use its clout to influence policy makers. With the release of the new ale, New Belgium and POW are launching “100 Days To Change,” a petition to make climate change the #1 priority for the incoming administration in its first 100 days. The petition outlines what the new president can do to get the climate ball rolling, including support for the Clean Power Plan, defense of the Paris Agreement, and more. This marks the second straight year the ice cream guru and beer behemoth have teamed up for a socially minded frankenbrew that benefits POW. Last year New Belgium released Salted Caramel Brownie Brown Ale and donated nearly $100,000 to POW’s efforts. Want to try the new beer for free (and sign the petition)? New Belgium and POW will host tasting / letter-writing events in 12 cities across the country, beginning this week.